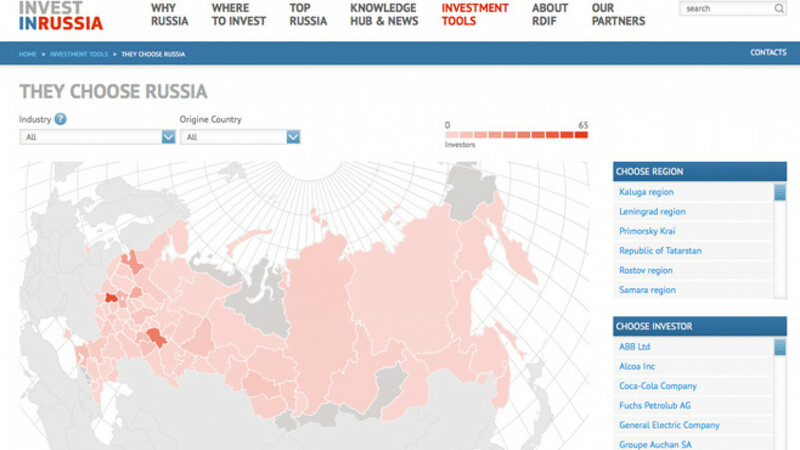 A screenshot of the Invest in Russia, online information portal for potential investors. The Russian Direct Investment Fund, or RDIF, on Monday launched an online information portal aimed at attracting foreign investors to Russia. The Invest in Russia "portal gives clear examples of the successes enjoyed by international investors in Russia" and "allows regions and agencies to attract investment by providing leading investors with information," said Kirill Dmitriev, head of RDIF, which was set up in 2011 to improve the investment climate in Russia by partnering with major foreign players to invest in joint projects and has built up a multibillion-dollar investment portfolio. The website — investinrussia.ru — is currently available only in English, but Dmitriev is hopeful that the site will have been translated into more languages by September or October. A Chinese version is now being prepared, Interfax reported. The site has various tools that prospective investors can use to get to grips with the key statistics relating to different industries and regions, including a database of planned projects that need financing and projects that have already been completed with the help of foreign investment. The "Where to Invest" section lets users compare up to four regions at a time in terms of, among other things, income per capita, unemployment and the amount of money foreigners have invested there going back as far as 2008. It also provides details of the shortest highway distance to the nearest border crossing and sea port for most regions. In addition, the "Our Partners" section provides contact details for the person responsible for attracting investment to each region. As well as informing prospective investors about opportunities in Russia, the portal hopes to have the added benefit of acquainting officials with the investment scene in their own regions. "We are faced with a situation where regional administrations are not aware of all of the projects being implemented in their territory and know about only 30 to 40 percent of foreign investors who are working there," Interfax quoted Natalya Borisova, head of RDIF's center for attracting investment to the regions, as saying.